WMPCDText is a free Windows Media Player plug-in for reading CD-Text information from audio CDs. CD-Text is an extension of the audio CD standard that allows you to store additional information on an audio CD, such as album name, album artist and track info. Many audio players like Winamp and RealPlayer can read CD-Text but Windows Media Player has never supported it. Until now, because the WMPCDText plug-in allows Windows Media Player to read CD-Text. 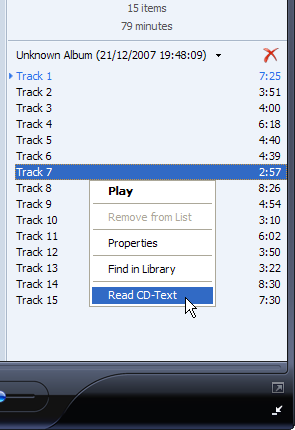 WMPCDText provides an option to automatically read CD-Text from unrecognized audio CDs. Alternatively, you can right-click on a CD track in Windows Media Player's Now Playing mode while a CD is playing, and select Read CD-Text (see screenshot below). WMPCDText especially comes in handy when using Windows Media Player for playing home-made audio CDs. Before WMPCDText, you would have to insert all the track information of such a CD manually into Windows Media Player. Now, just make sure that the CD-Text information is burned onto the CD, play the burned CD with Windows Media Player, and WMPCDText will automatically read the track information from the CD itself and insert it into the Media Library. The plug-in is written for Windows Media Player 11 and higher. For reading CD-Text on Windows XP and Windows Server 2003, administrator rights are required. However, you can use Nero BurnRights to make reading CD-Text possible without administrator rights too. Comments, questions, problems, bug reports etc. can be posted in the WMPCDText thread at the Hydrogenaudio Forums. Before clicking "Read CD-Text"... ... after clicking "Read CD-Text". WMPCDText has read the track information from the CD. Fixed: when trying to access the plug-in settings of WMPCDText 1.3 while the plug-in was disabled, either the settings didn't appear or Windows Media Player would crash. Fixed: the "Read CD-Text" menu item didn't appear in non-English versions of Windows Media Player 12. Fixed: crash when opening Windows Media Player 12 with a very long command line (such as when Windows Media Player is opened by clicking on an MP3 hyperlink in Internet Explorer). Fixed: WMPCDText always tried to show its settings window on the first Windows Media Player run after install, even when Windows Media Player was running invisibly in the background (such as is the case with Windows Media Center). This also caused 'unauthorized window' errors in the event log while using a Windows Media Center Extender. Dropped support for Windows Media Player 10. Preliminary support for Windows Media Player 12 on Windows 8. The "Read CD-Text" menu item is shown in the Play List pane on the right, both in Library and Now Playing mode. Removed the compatibility warning that was displayed on the first Windows Media Player launch after installing WMPCDText. Fixed: "Error while executing SCSI command: SRB completed with error (4)" message when WMPCDText tried to read CD-Text on some systems. Fixed: On Windows Vista, the installer failed to find Windows Media Player and displayed an error message.